Barack Obama owes his new job largely to two organisations-Communist Party USA (CPUSA) and the allied and much larger Democratic Socialists of America (DSA). These two organisations share similar agendas. Both aim for a socialised and much weakened America-brought about through slashed military expenditure, socialised medicine, a massive increase in union power and large scale re-distribution of wealth. Both organisations see the Obama administration as an opportunity to move the US way to the left, through what I describe as the "sandwich strategy". The plan is to stack Obama's administration with as many sympathisers and socialists as possible-one slice of bread. Then create a massive "peoples movement" of protest groups, mass organisations and "community groups"-the other slice of bread-to pressure Obama into moving in the desired direction. Obama will then be able to implement socialist measures in response to "public demand." The US taxpaying middle class will of course be the meat in the middle. For their January-February issue, Tikkun Magazine asked a number of "liberal and leftist academics and activists" to draft a "Memo to President Obama". DSA's Labour movement blog Talking Union has pre-published a memo drafted by Temple University politics lecturer and Democratic Socialists of America Vice-Chair Joseph Schwartz. Tikkun, incidentally is run by former Students for a Democratic Society radical and one time DSA member Rabbi Michael Lerner and DSA honorary chair and member of Obama's Black Advisory Council, Cornel West. 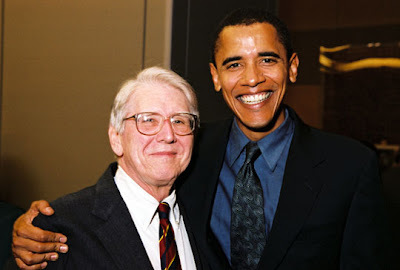 Joseph Schwartz and Obama go way back. Over three hundred people attended the first of two Town Meetings on Economic Insecurity on February 25 in Ida Noyes Hall at the University of Chicago. Entitled "Employment and Survival in Urban America", the meeting was sponsored by the UofC DSA Youth Section, Chicago DSA and University Democrats. The panelists were Toni Preckwinkle, Alderman of Chicago's 4th Ward; Barack Obama, candidate for the 13th Illinois Senate District; Professor William Julius Wilson, Center for the Study of Urban Inequality at the University of Chicago; Professor Michael Dawson, University of Chicago; and Professor Joseph Schwartz, Temple University and a member of DSA's National Political Committee. So what advice does comrade Schwartz have for the president elect? Some extracts, with commentary and interpretation from New Zeal. Schwartz The impressive depth and breadth of your electoral victory, combined with Democratic gains in both the House and the Senate, provides the possibility of reversing three decades of growing inequality that is the primary cause of an impending depression. But to do so you will have to act boldly and quickly. As a constitutional law scholar, you realize that the system of checks and balances and separation of powers established by our founders consciously aimed to forestall rapid change. Thus, almost all the reforms we identify with the twentieth-century Democratic Party—Social Security, the National Labor Relations Act, the Civil Rights Acts, and Medicare—occurred in the periods 1935-1938 and 1964-1966, the only times when the Democrats controlled the presidency and had strong majorities in both chambers of Congress. New Zeal In other words Schwartz is advising Obama to "blitzkreig" the system, so that constitutional checks and balances can be quickly over-ridden or by-passed. There is a rare window of opportunity here to create significant socialist change. Schwartz If upon taking office you lead with boldness, your administration could pass major legislation in regard to universal health care, massive investment in green technology, and labor law reform that would transform United States social relations for generations to come. But as a former community organizer you know that such reforms did not come from the top down; they arose because moderate elites made concessions to the movements of the unemployed and the CIO in the 1930s and to the Civil Rights, anti-war, women’s, and welfare rights movements of the 1960s. While your office cannot conjure up mass social movements, you can call your supporters to ongoing grassroots activism. New Zeal Schwartz is referring here to the communist led union/mass movements of the 1930s which pushed Roosevelt into the "New Deal" and the communist/New Left led movements of the 1960s which brought about Lyndon Johnson's "New Society". DSA sees the next few years as the next "New Deal" Schwartz wants Obama to be guided by (and no doubt to finance) this movement. Obama's encouragement of the recent CPUSA/DSA supported Republic strike in Chicago is perhaps an indicator of things to come. The stimulus package should include major government funding of job training in the inner cities (in green technologies, for example) and of opportunities for both GIs and displaced workers to return to university as full-time students (and for women on TANF to fulfill their “workfare” requirements through secondary and higher education pursuits). While affluent suburbs provide their residents superb public education and public services, federal cutbacks in aid to states and municipalities has worsened the life opportunities of inner city residents. Your election as the first African American president is of inestimable symbolic import; but its promise will be soured if your administration does nothing to address inner city poverty and the massive rise in the incarceration of young youth of color. Only federal funding of pre-K education and of after-school programs for vulnerable youth can begin to redress rampant educational inequalities. New Zeal Re-distribute the wealth-especially to the areas where socialists are most influential. Fund government programs that socialists will control. The communists of the 1930s infiltrated and lived off Roosevelt's myriad make-work schemes. The socialists of the new century aim to do the same. Re-distribute the wealth-especially to socialists. Schwartz The inefficient and inequitable United States health care system cries out for replacement by a universal and cost-efficient alternative... While the power of the insurance lobby may preclude your backing a national single-payer bill, you must back progressive Democratic amendments for opt-out provisions from your “pay or play” system of private insurance. Such opt-outs would allow states to create their own single-payer systems, and allow Medicare or the federal employees health plan to market to employers as a lower-cost alternative to private group plans. New Zeal Single payer or socialised medicine is at the top of the DSA/CPUSA agenda. The socialists see socialised medicine as a way of making the US middle class dependent on the state-particularly the Democratic Party "state". Chicago physician Quentin Young, a DSA member and personal friend of Obama's has been pushing this for years through his Physicians for a National Health Program. Strong Obama ally Congressman John Conyers (Democrat, Mi), an alleged DSA member with life long ties to CPUSA has been pushing his HR676 health proposal in Congress and through the union movement. Conyers wrote on his blog 28.12.08 Already nearly 9,000 people have sent the message online to the incoming Obama Administration that single payer is the one true health care reform that the country desperately needs. Now there are citizens groups across the country meeting to come together to collectively call upon the President-elect to consider single payer health care. Schwartz But how to pay for all this? You should attempt to reverse not only the Bush tax cuts, but also the Reagan-era cuts in marginal rates on high-income earners (approximately $300 billion in revenues, each). In addition, abolishing the 15 percent tax rate on hedge fund and private equity managers’ earnings could garner another $100 billion in annual revenues. New Zeal Taxes, taxes and more taxes-the socialists answer to every problem..
Schwartz Ending the war in Iraq should save $100 billion per annum; a one-third cutback in United States military bases abroad and an end to Cold War era plans to build a next generation of fighters and an anti-ballistic missile defense could save $216 billion in federal revenue per year. The military budget is hideously oversized for a nation that claims armaments are necessary for defense, and not defense of empire. New Zeal Time to give Russia, China, Cuba, Iran, North Korea, Venezuela and Al Qaida their turn on top. Shwartz When the Ponzi scheme of “securitized mortgages” collapsed with the end of the irrational run-up in housing prices, the federal government had to bail out Bear Stearns, then Fannie Mae and Freddie Mac, and then AIG. American capitalism has privatized gain, but socialized risk. Yet if risk is to be socialized, then so should investments. Your administration should not only demand equity shares in the banks and corporations that are bailed out by the public treasury, but should also require that consumer, worker, and government representatives be added to the board of directors of corporations receiving government aid. New Zeal Get the unions and "peoples organisations" into the board rooms. Don't waste this great opportunity to socialise "Big Business". New Zeal You owe us! Schwartz is reminding Obama that the unions got him elected, so he owes them (and by extension their communist and socialist leaders) his soul. Schwartz wants Obama to resist pressure to can the Employee Free Choice Act, which basically abolishes secret ballots in the workplace and gives union goons tremendous power to re-unionise the workforce. Schwartz Your victory by no means guarantees the bold policy initiatives necessary to restoring equity with growth to the United States economy. Your campaign did not advocate major defense cuts, progressive tax reform, and significant expansion of public provision. But FDR did not campaign on bold solutions in 1932. It was pressure from below that forced FDR’s hand. Similarly your victory may provide space for social movements to agitate in favor of economic justice and a democratic foreign policy. But as a president who understands the process of social change, I trust that you will understand that those demanding the most from your administration are those who can best help you succeed in office. New Zeal Okay president-elect Obama, we know you didn't campaign on socialism, but FDR didn't campaign on the "New Deal" either. He did what he did, because the communists forced him to. We're going to pressure you too. You understand what we are doing. We're not really going to attack you, we're trying to help. We're going to give you president-elect Obama the excuse to implement the socialist agenda we all desire. New Zeal In other words Shwartz is warning Obama to blitzkreig the system, so that constitutional checks and balances can be quickly over-ridden or by-passed. No, not at all. It's simply a recommendation to make good use of the Democratic majorities in the House and Senate.